At school they taught us lot of things. For example you may have been taught that a construction of Paramecium bacteria. This doesn't seem to be a vital knowledge for everybody... or for almost nobody. You may even have learned how to crate a computer program, but if you are not going to be or are not a programmer that won't be much of a use. You may not even be a coder, but most probably you are going to use a computer at your work if you aren't already. In today's era of smartphones and other mobile devices, using a keyboard may seem a bit archaic. But is it? Do you realize how touch typing is important? In today's world many professions are based on using a computer. If you are a lawyer, work in a call center, you are a programmer or a writer, you use a computer. Whether it is a lapotp or a desktop, it has a keyboard - the best device to insert text invented so far. If you spend a significant amount of time in front your computer, you should be able to type without looking at your keyboard. But why? It takes some time to learn how to touch type. It takes effort and at the beginning you even type slower than if you didn't use any technique. We try to explain why it is important to learn touch typing. As you improve your touch typing skills, you will enjoy the benefits it gives you. If only you spend 3 hours per day typing and you double your typing speed, you can save, let's say 1 hour daily - this is 250 working hours per year; this gives you 31 whole days yearly. Instead of constantly looking at the keys before one of them is pressed, you are focused on the text which you type. Your muscles are programmed to write correctly, so you do not need to think about mechanics of typing. If you don't use every finger to type, or worse, use only your forefingers to press the keys, that is a terrible waste of time. Moving your sight from the keyboard to your monitor and back again consumes more time than pressing one key. If you type this way, you first need to focus on your hand, than on your keyboard, than on the monitor and find the place where the text ends. It takes a great amount of energy which is wasted. Touch typing doesn't have this problem because you don't need to focus on how you type. Your sight is focused on you monitor all the time so your head doesn't move. Your hands are not strained and fingers move in a natural way. Touch typing forces a correct position of the spine. You do not duck looking at the keyboard. Your sight is directed on the monitor - ahead, so the neck is not bent down. To keep your hands better aligned, you should be inclined from the keyboard, so the whole body strives to be arranged in the most optimal way for fast typing. Touch typing improves typing accuracy. It would seem that if you do not think about how you type, then you may make mistakes, but your muscles are programmed to type correctly. That is why it is so important to focus on accurracy during early learning, rather than on the speed of typing. Try to write with 100% accuracy. Correct your mistakes, then with time, you will really type much faster. Touch typing leads to a reduction in the amount of time spent on a given task that requires typing with your keyboard. You can do more work because you have more time. Touch typing allows you to quickly correct mistakes in the writing that you make. Errors that were made during typing using hunt and peck method are harder to see. It happens that people who are typing and looking at the keyboard enter some text, then they notice on the moniotor that nothing has been entered. Touch typing makes your attention focused on what has already been typed, so you can immediately see where the error was made. Fast touch typing takes thoughts from our minds about the typing itself. This is similar to riding a bike or driving a car. You do not focus on driving mechanism - you are not looking at gear shift or steering wheel, you do not you think, as far as the degrees to cross the steering wheel to turn. It's all happening automatically, just like typing, you're not wondering where the key is. Your muscles know that. This is the so-called muscle memory, which memorizes the correct movements of the hands and fingers. Touch typing is something you can boast about before your prospective empoloyee in your CV. This is a skill that is respected by others. Even good professionals who type slowly can appreciate the touch typing skill. This is unfortunately a skill that fades a bit. Now many people use two thumbs to type on the keyboards of their smartphones, and when they come to the keyboard they peck with two fingers - that doesn't look good at all. 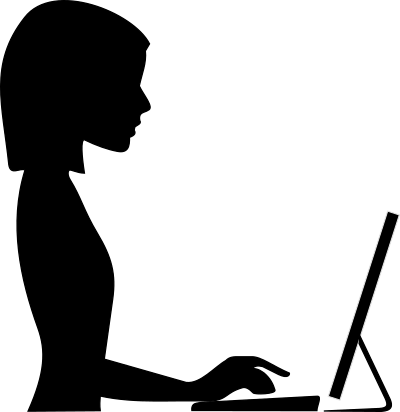 If you consider yourself a professional in a particular field, but you are sitting hunched and you peck two fingers on your keyboard, your professionalism can raise doubts. If you have spent so much time studying your own field, and you did not bother to learn to touch type, something here is wrong! This can raise mixed feelings among others, but subconsciously your self-evaluation falls. Typing faster and correctly , increases your self-esteem and this is not to be overestimated. Touch typing is much more beneficial than typing by looking at the keyboard. You cannot have any doubts about it. The only obstacle that is in touch typing is the cost of your time and effort which one has to take to learn to touch type.